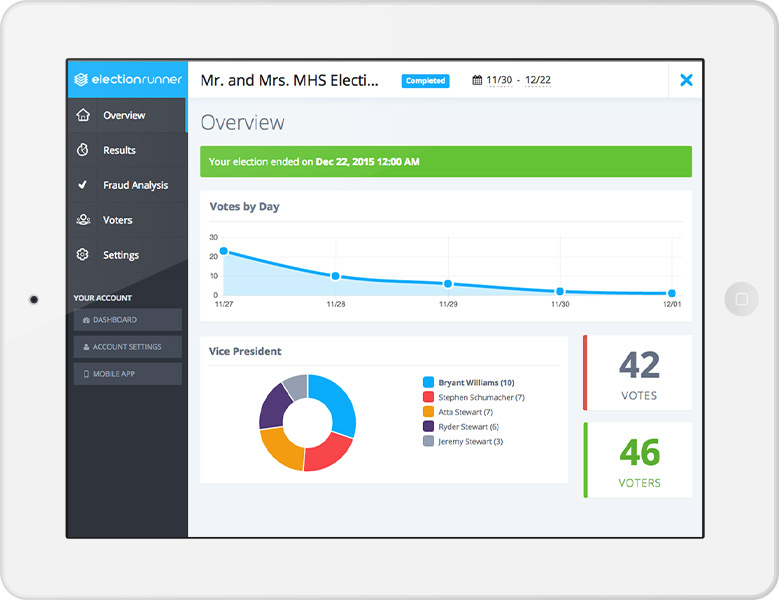 Election Runner makes it easy to build and manage school elections. Students can vote from any location, on any device. School elections. Any device. Any location. Each student has a unique "Voter ID" and "Voter Key" and can only vote once. Elections are optimized for desktop and mobile devices. Students can vote from a web browser or our iOS & Android apps. Personalize your election with your school's logo and colors. No HTML/CSS knowledge necessary. All elections have SSL (https://) grade security with 256bit encryption that keeps your election, ballots and student data secure. Provide an optional email address for your students and we'll notify them when your election launches. Import your student voters from an excel spreadsheet or CSV file. Build your election in a matter of minutes with our easy to use interface. Election results are automatically calculated and presented with beautiful charts. Have a question? Need help? We're one call/email away. Our average response time is 8 minutes! You're always in control with Election Runner. It's quick & easy to build and customize your elections. Add positions and candidates. Each student candidate can have a picture and/or short bio. Add your voters individually, or import them by the thousands. You control who votes in your elections. When you're done customizing your election, you can schedule the start & end date or immediately launch it. Watch the results of your election in real-time. Results are automatically tabulated to save you time. We accept Credit Card, Check, and Purchase Orders. Please contact us if you have any questions. * As low as $.09/voter. See Pay-Per-Election pricing. "Over the last few years I've tried many online voting systems, and none compare to Election Runner. I couldn't believe how easy it was to create an election. It used to take me hours, but now I can launch an election in less than 15 minutes. I highly recommend Election Runner for your elections." "Election Runner has completely revolutionized online elections. Its simple format allowed me to launch an election quickly and accurately. It is easy to manage, even for the most technically challenged user. Goodbye Election Buddy and Voting4Schools!" "Our elections went off without a hitch. Awesome user experience. The students really enjoyed voting this way." "This is the most amazing program! So easy to use and worked perfectly! Saves AMAZING amounts of time!" Try a free demo and see why thousands of schools are switching to online election software for their voting needs.